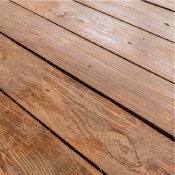 Wood, composite wood and many other types of wood are notorious for mold and mildew growth. Whether the mold problems are indoor or outdoor, Concrobium Mold Control can eliminate and prevent mold on wood, composite wood, plywood, OSB and many other types of wood with a few very easy steps. 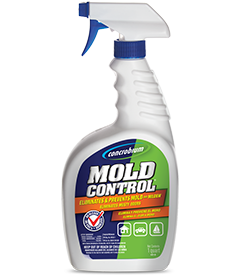 Using a spray bottle or garden sprayer, apply a thin, even application of Concrobium Mold Control to moldy wood rafters, walls or flooring surfaces. Allow to dry completely; Concrobium eliminates mold as it dries on the surface. Clean the moldy surface with a Concrobium dampened cloth or brush to remove remaining mold residue. 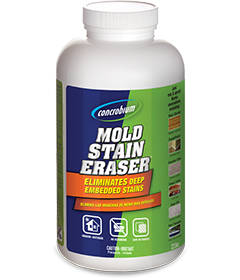 For deep embedded stains, try Concrobium Mold Stain Eraser to eliminate stains quickly with no scrubbing. Re-apply Concrobium ensuring a thin, even application of the product remains on the surface to provide future mold resistance. Did you know Concrobium can also be used to pre-treat wood? Use Concrobium during construction and renovation projects to prevent mold growth even before it becomes a problem.